“For richer, for poorer…” These four little words in traditional wedding vows carry great significance. Unless they already live in poverty, most newlyweds don’t enter marriage expecting to stay or become poor. Rather, couples hope to prosper over time through hard work and perseverance. These words also reflect a central issue in charitable giving. One of the most common struggles people have in their giving decisions is an uneasy sense of loss at what is given away. Some feel if they give, they will become poorer while the recipient becomes richer. Instead of giving with a cheerful heart for the Lord’s work (2 Corinthians 9:7), the giver often weighs the cost of giving based on how much they feel they can afford to lose. The question “How much poorer am I willing to be?” becomes the determining factor in deciding how much they want to give. Ironically, almost none of us feel poorer when we put money aside for retirement, invest in stock, or make a house payment. On the contrary, we feel financially more secure by doing so, even though our net worth hasn’t changed. We understand we’ve simply transferred a portion of our resources into a different asset that will be beneficial in the future. God has temporarily entrusted a portion of His resources into our care to accomplish His work here on Earth. Scripture teaches a similar approach but with a completely opposite focus. To begin with, you and I don’t really “own” anything. If God created the world, He is the sole and rightful owner of the entire cosmos. Everything that exists comes from the God who “gives to all life, breath, and all things” (Acts 17:25, emphasis added). But we are God’s stewards (Genesis 1:28). God has temporarily entrusted a portion of His resources into our care to accomplish His work here on Earth. And as the great Creator-Owner, God is just and right to expect an accounting one day (1 Corinthians 3:10-15). But a marvelous part of the message of Scripture is that we are privileged to participate with God as His “fellow workers” (1 Corinthians 3:9). And as co-laborers with God, we are promised great rewards for the work we do for Him. The Lord Jesus said as much when He counseled the disciples to “lay up for yourselves treasures in heaven” (Matthew 6:20), which Paul echoed when he commanded rich believers to be “ready to give, willing to share” in order to store up “for themselves a good foundation for the time to come” (1 Timothy 6:18-19). Notice that these “treasures” and “good foundations” are not being deposited in heaven for God, or for the poor and needy, or even for the lost—they are for us. We are not losing anything when we give to God’s work but are simply transferring available “assets” into an account that will pay everlasting dividends. In view of these passages, feeling poorer when we give to the Lord’s work is just flat-out wrong! Rather, we are blessed and far richer when we give because we have willingly transferred some of our God-given resources into the heavenly account that will be waiting for us when we “retire” from this life. As co-laborers with God, we are promised great rewards for the work we do for Him. 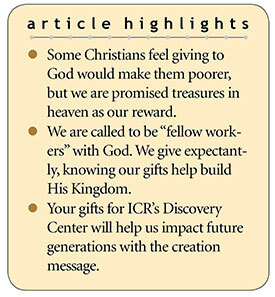 Consider giving a portion of your treasure to the ministry work of the Institute for Creation Research. We are currently building the ICR Discovery Center for Science and Earth History, which will reach far beyond our lifetimes. Your generous gifts will establish a biblical legacy that will impact many “generation[s] to come,” even the “children who would be born” (Psalm 78:6). Cite this article: Henry M. Morris IV. 2018. For Richer, for Poorer. Acts & Facts. 47 (9).